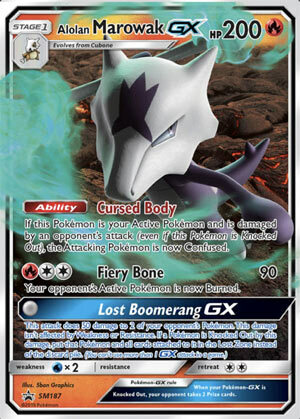 Today we’re looking at a promo that hasn’t quite released yet, Alolan Marowak-GX (SM – Black Star Promos SM187). If my information is accurate, it’s officially scheduled to debut in the “Alolan Marowak-GX Box” on May 3 of this year. It evolves from Cubone, just like the various Marowak and Alolan Marowak cards. As a Pokémon-GX, it gives up an extra Prize when KO’d, has more HP than its baseline versions, may also have better effects, has a GX-attack, can access a small amount of support, and has to deal with some significant counters. It is another [R] Type, which may come in handy for attacking the (usually) [R] Weak [G] and [M] Pokémon, and a little bit of Type support, though you may run into the odd anti-[R] effect (namely, the non-Bench shrinking side of Parallel City). As a Stage 1 Pokémon, Alolan Marowak-GX isn’t too difficult to run, whether as the focus of a deck or even as TecH; if something more important isn’t using it. Alolan Marowak-GX has 200 HP, enough to be more likely to survive an attack than be OHKO’d, though many decks will have the capacity to score a OHKO with a proper setup. Some will have an easier time of it because the deck is built around OHKO’s or can exploit this card’s [W] Weakness. It has no Resistance to give it a slightly favorable matchup, but most cards don’t so we’ll move onto the Retreat Cost. [CC] is high low enough you can probably pay it but high enough you’re better off if you can avoid it; better to build your deck with some methods of bypassing or reducing the Retreat Cost. Which isn’t too hard, considering most decks should already be running two or more copies of Guzma. Alolan Marowak-GX has an Ability, an attack, and a GX-attack. The Ability is “Cursed Body”, and it only triggers when this Pokémon is damaged by an opponent’s attack, and even then, only while this Pokémon is your Active. Cursed Body then Confuses your opponent’s attacking Pokémon. This isn’t bad, but it is far from good; timing matters. Your opponent’s Pokémon won’t be Confused until after attacking, which means there’s a chance Alolan Marowak-GX gets KO’d regardless of the Ability. There’s also a decent chance that Confusion won’t matter, and I don’t mean because your opponent might get rid of it on their turn. You usually want to KO your opponent’s attacking Pokémon ASAP, which means potentially KOing them before either player can do anything with the Confusion. [RCC] pays for “Fiery Bone”, which does 90 damage plus Burn; it isn’t a huge return for three Energy on a Stage 1 Pokémon-GX, but it is priced in a manner that Double Colorless Energy can meet most of the cost. “Lost Boomerang-GX” can be used for no Energy, unusual but not unprecedented for GX-attacks. It lets you do 50 damage to two of your opponent’s Pokémon, and a Pokémon KO’d by this attack (plus all cards attached to it) are sent to the Lost Zone instead of the discard pile. That’s actually kind of good. This could really mess up slower decks which need to Evolve from low-HP Basic Pokémon, or just some decent targets in general if combined with other spread effects. It is a long shot, but it might actually qualify as TecH due to the combination of the Ability and GX-attack, but I wouldn’t hold my breath. Addendum: My apologies, but I left out two specific combos, each of which could be used to build an Alolan Marowak-GX deck. I had these in mind while scoring the card, I just neglected to actually mention them. In both cases, we’re looking at a Stage 1 Bench-sitter to help offset the so-so damage from Fiery Bone. The first is Lurantis (SM – Black Star Promos SM25), as its Ability “Sunny Day” provides a nice, simple +20 do the damage done by attacks from your [G] or [R] Pokémon. The second is Parasect (SM – Team Up 7/181) and its “Panic Spores” Ability, which places two damage counters on your opponent’s Confused Pokémon between turns. However, I do not expect either to produce a truly competitive deck. Feel free to prove me wrong if you can!